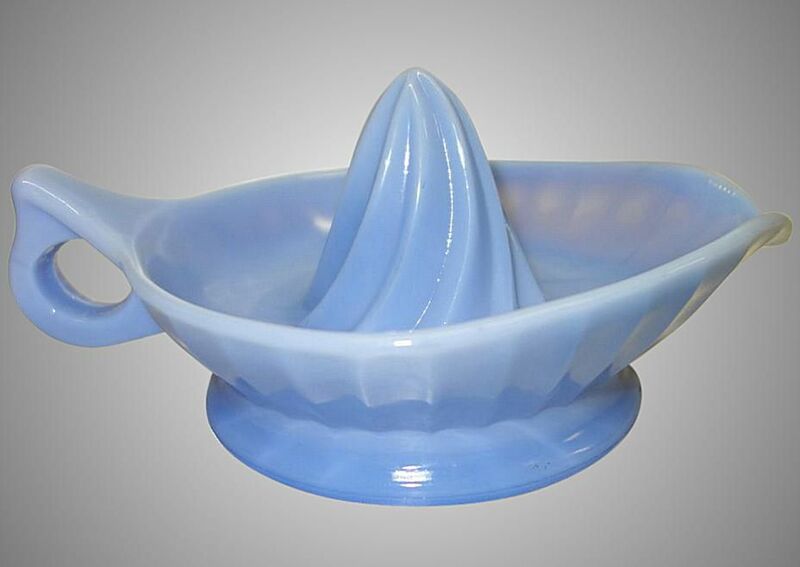 Kitchenware of the Depression era was made in an array of beautiful hues, both opaque and transparent. In fact, no matter what type of kitchen décor you prefer, from vintage to modern, there are vintage glass styles and colors available to complement your theme. Read on to learn more about a number of popular types of glass kitchenware made from the Depression era through the 1940s or so. Delphite is medium blue opaque glass made beginning in the 1920s by Jeannette Glass Company, but also used by other glassware manufacturers such as McKee. The McKee version is a bit lighter in color when compared to pieces made by Jeannette. A good variety of Depression-era kitchenware was made using Delphite glass but authentic, old pieces including canisters, measuring cups, shakers, and reamers like the one shown here are far from plentiful and they sell for good sums. Dinnerware pieces can also be found in Depression glass patterns such as Doric and Cherry Blossom. Other novelty items were also made of Delphite glass such as cowboy hats sold at the Texas Centennial Exposition. This shouldn’t be confused with “Chalaine” blue glass, which is lighter in color than ​delphite. In his books, Gene Florence describes Chalaine as a robin’s egg blue color and that’s pretty accurate for this pale hue. Chalaine blue glass is much harder to find than Delphite, and a rolling pin or measuring cup in this light color can sell in the thousands. More than likely, your opaque blue glass is Delphite but it never hurts to be sure given the disparity in rarity. This type of opaque green glass made beginning in the 1940s by companies such as Anchor Hocking, Jeannette, and McKee. The trade name Jade-ite was used by Anchor Hocking for this type of glass which simulates the light jade gemstone. The majority of those pieces were branded as Fire-King wares. Martha Stewart re-popularized Fire-King's Jade-ite by decorating the shelves of her on-air kitchen with stacks of this glass and featuring it on the cover of her magazine in the 1990s and the price rose substantially during that period. Jadite glass made by McKee was named “Skokie Green” by the company. Fire-King and McKee greens differ slightly in color, with Fire-King being the darker of the two. Prolific amounts of kitchenware were made using Jadite glass but dinnerware sets and heavy restaurant ware made under the Fire-King brand can also be found and those are equally as popular with collectors. Jadite should not be confused with “Clambroth” green glass. Clambroth is lighter in color than Jadite and it is more translucent in comparison. It is also not as plentiful, so collectors do not run across it as often as Jadite although it’s good to know the difference. Values are similar except for rarities in either variety. Platonite is sometimes referenced as milk glass in error by collectors and novice dealers just starting to dabble in vintage glassware. Patented by Hazel Atlas Glass Co. in 1936, it was actually used in a wide variety of kitchenware pieces as early as the 1920s. The raised HA logo, which should not be confused with Anchor Hocking, can be found on many of these items. Collectors find refrigerator dishes, shaker sets, milk pitchers, mixing bowls, reamers, and other items made of this glass. When used in these heavier kitchen items, the glass does more resemble milk glass in comparison to Hazel Atlas dinnerware made later. Many of the dinnerware pieces were not marked. Take care not to confuse Platonite with what collectors reference as “Clambroth” due to its milky white hue, which does resemble actual clam broth in color. Clambroth glass will be more translucent in color when compared to Platonite, especially when used in heavy kitchenware items. Amber includes the dusty yellow color found most often in Depression-era dinnerware patterns. But if that’s not your speed, you can find pieces made by companies such as Paden City and Westmoreland in a richer honey amber color. Although these aren’t as common as the yellowish items, things like batter jugs, sugar shakers, and reamers can be ferreted out with some diligence. Blue glass ranges from Delphite and Chalaine, elaborated upon above, to the traditional cobalt blue used in dinnerware by Hazel Atlas and other companies. Cobalt blue is fairly plentiful, but its popularity has driven prices higher in comparison to other colors and reproductions of many pieces have followed suit. Another transparent blue glass that is lighter in color than cobalt is peacock. The color is, in fact, very similar to the color in a peacock’s feathers but you won’t run into this hue often as it is considered rare. Green kitchen glass came in a wide variety of color choices when it was new. Jadeite, illustrated above, is very popular with collectors today. Kitchenware was made in traditional transparent green that matches Depression glass dinnerware, and it does contain uranium so it glows under a black light. Many companies produced kitchenware in transparent green including Federal, Hocking, Hazel Atlas, and Jeannette so it is quite plentiful. Other greens include forest green and “Clambroth.” Forest green is a deep green color, while Clambroth is somewhat similar to Jade-ite but more translucent, as noted above. Pink Depression glass, like transparent green, was used by many different companies to make kitchenware during the Depression years. In fact, if a company made pink transparent dinnerware during that era, it’s quite likely that they made utilitarian kitchen items as well. Colors range from very pale pink to a deep orange-tinged hue. A limited number of red glass kitchen pieces can also be found as well as those with bright fired on colors that emulate opaque glass. Red transparent glass was used by Hocking, Hazel Atlas, and others. The fired-on colors most popular were yellow, green, red, and dark blue on a white glass base and those pieces were also made by a variety of glass factories through the 1940s. Yellow was also used for kitchenware in both opaque and transparent versions. McKee glass named its opaque yellow glass “Seville,” and care should be taken not to confuse it with custard glass. A limited number of custard glass pieces were also made. The transparent yellow glass used for kitchen utility pieces is akin to traditional yellow Depression dinnerware patterns. It is much lighter in color than amber.